This is ridiculously late notice on my part, but if you're in NY (or taking the train up tomorrow morning with me) it's not too late to see three talented Irish writers read from their work at NYU's Glucksman Ireland House, tomorrow night (December 2) at 7 p.m. I've raved often about Claire Kilroy's books, including her latest, All Names Have Been Changed, about a group studying creative writing at Trinity College in the '80s. I absolutely loved Paul Murray's quirky and hilarious first novel, An Evening of Long Goodbyes, and I'm looking forward to three hours of uninterrupted Amtrak time to find out what happens at the Hallowe'en Hop at Seabrook College in his new novel, Skippy Dies, which has been long listed for the Man Booker Prize. Kevin Barry's debut book of short stories, There Are Little Kingdoms, received the 2007 Rooney Prize for Irish Literature. I haven't read Barry's book yet, but that makes the event more fun. It's like tapas. You can reserve a spot by calling 212-998-3950 (option 3) or emailing ireland.house@nyu.edu. Those who aren't members of Ireland House can give a $10 donation at the door. Some time after my friend Jabber's baby was born, she (Jabber, that is, not the baby) took to the web and started sharing her experience raising a baby in Manhattan. Eight months ago, to my great delight, Jabber and her family moved back down to Washington, where they belong, in my humble, self-interested opinion. Now Jabber's focus is on life with her toddler in DC, as her blog, Jabberjaw, puts it. But if you're a new mom you don't have to live in DC to benefit from Jabber's now DC-centric blog, any more than you had to live in New York to benefit from it before, because she also chronicles the place-transcendent experience of life with a youngster, and provides exhaustive reviews of baby products (for want of a better term). And even if you don't have children, she's an entertaining writer who's always fun to read (and those baby product reviews come in mighty handy for baby showers). It's Bloomsday again, and whether you're in New York or anywhere with an Internet connection, here are a few ways to mark the event: attend a reading at Symphony Space in New York (95th and Broadway) at 7 pm, listen to its live webcast, tune in to WBAI (99.5 FM) in New York for its offering of Joyce readings, or listen to its live webcast, from 7 pm to 4 am. This program will also be heard on many Pacifica-affiliated radio stations. The New York Times describes the events as follows (read the full article for why the theater and radio productions are going their separate ways this year). In the Symphony Space production Stephen Colbert and Frank and Malachy McCourt will read from the novel’s Ithaca episode. Then after a musical interlude by the soprano Judith Kellock, the event will conclude with a reading by Fionnula Flanagan of the book’s ending episode, Molly Bloom’s drifting nighttime thoughts. My favorite brunch spot in New York has changed spots. 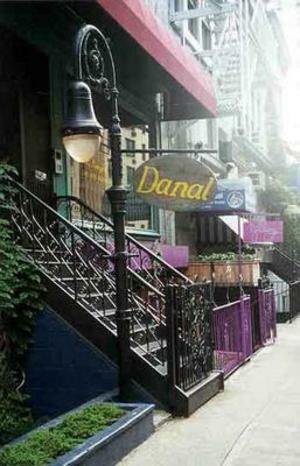 Danal, formerly on E. 10th Street, has moved to Fifth Ave. between 12th and 13th Streets. From the outside it's less charming than before, and in fact barely noticeable, tucked in next to a building undergoing a face lift. 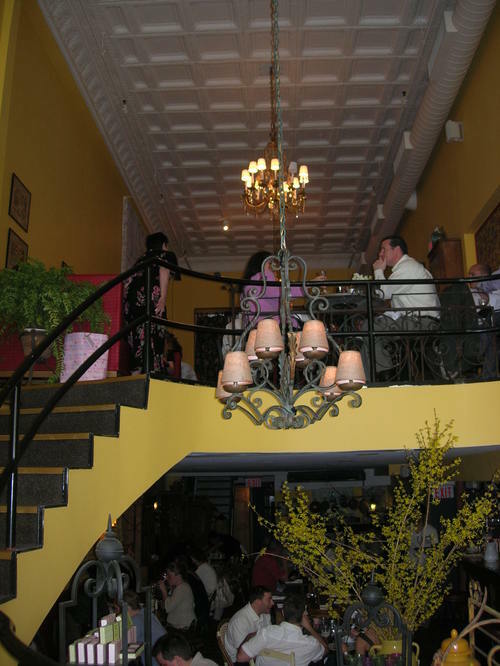 Inside it still has a French country vibe, but is a bit more upscale than it used to be. Part of me misses the hectic bustle of the old place, where the kitchen was basically in the dining room, but some will appreciate the more genteel atmosphere. The brunch menu is the same mix of breakfasty and lunchy options that I described before. Hectic bustle or not, the cafe au lait is still creamy, mysterywriter reports the hot chocolate is still delightful, and the tart I had on Saturday was just the ticket to fuel a shopping binge at Darryl's. Ten years ago or so on a wet November afternoon mysterywriter, Dubliner, and I ducked into the Union Square Barnes & Noble to get out of the rain and ended up frittering away a good three hours browsing books. (That was a record even for us.) Afterward we wandered up Broadway and came upon a film shoot across from the Flatiron Building. We waited an inordinately long time in the cold drizzle for what ended up being a disappointing payoff: watching Vince Vaughn get into a limo and drive off (a scene, evidently, in "Return to Paradise"). Never linger at a film shoot with high hopes. Fortunately, our dejected, aimless wandering afterward took us eastward to Third Avenue, where we happened upon Molly's Shebeen. We couldn't see in and were dubious, but were so cold and wet that we figured we'd go in for a pint while we warmed up and figured out our dinner plans. Once in, we never wanted to leave (and didn't, for hours). 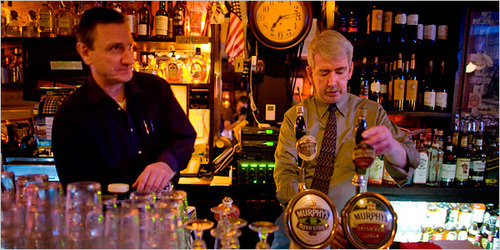 We found ourselves in a cozy, authentic, neighborhood Irish pub, with a fireplace, perfectly drawn Guinness, good Shepherd's pie, and an assortment of locals both behind and in front of the bar (including one patron with a little dog on his lap). We've gone back many times. One evening mysterywriter had to get up early for work the next day. Every time the server came by and asked if we wanted another round mysterywriter would say "none for me, thanks," and the server would say, in her lovely, lilting accent, "how about a half pint?" I don't remember how many half pints mw had that night. It is a place to have a pint by the fire or, even better, to have a meal in the back under the glow of warm orange lighting from chandelierlike fixtures, and walls with dusty memorabilia that the warm orange lighting doesn’t quite allow you to make out. Shepherd’s pie, fish and chips, chicken pot pie, lamb stew are all served in a homey style that even the most non-Irish person in the world (say, a Bangladeshi farmer) would recognize as comfort food. 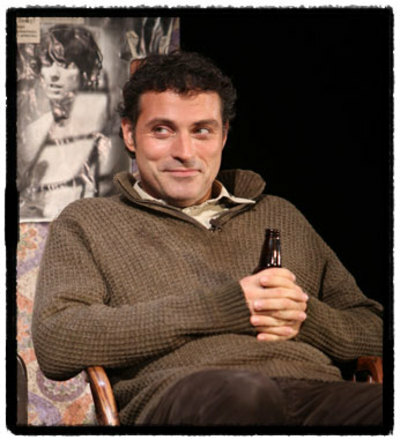 If I'm being honest, I have to admit that Rufus Sewell's name on the marquee caught my attention before Tom Stoppard's. But Stoppard's brilliant writing, Rufus's swarthy good looks, a talented cast all around (including Brian Cox and Sinead Cusack), and classic rock and roll music could only add up to a great time at the theater. And it was. There's only a few days left to see Stoppard's Rock n Roll on Broadway -- it closes March 9. You can still find discounted tickets at broadwaybox.com. If you don't know much about the Prague Spring, Pink Floyd, or the Plastic People of the Universe, you might want to do a little homework first. Even if you don't, just go with the flow -- so what if you don't get half of it? Isn't that what Stoppard's all about? Thinking about seeing a show in New York this holiday season? Here's a way to get discount tickets in advance and without standing in line in the cold in Times Square. Broadwaybox.com offers discount codes for dozens of shows on Broadway and off. They don't sell the tickets themselves -- in fact, they are just a clearinghouse for codes provided by members of the public. But you can click through to the ticket agency to get the discount. Or if you live in New York and want to avoid the service charge, do like my neighbor, a former New Yorker who told me about the site, used to do: bring the code to the the theater and buy the tickets there. The site doesn't just offer discounts to long-running tourist attractions. 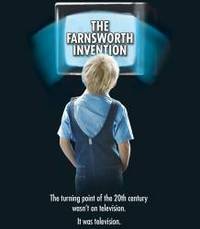 For example, the site says the codes will get you 40% or more off tickets to Conor McPherson's "The Seafarer" (which I highly recommend) or Aaron Sorkin's "The Farnsworth Invention," and up to 45% off Tom Stoppard's "Rock 'n' Roll." The Seafarer is a chilling new play about the sea, Ireland, and the power of myth. It's Christmas Eve and Sharky has returned to Dublin to look after his irascible, aging brother who's recently gone blind. Old drinking buddies Ivan and Nicky are holed up at the house too, hoping to play some cards. But with the arrival of a stranger from the distant past, the stakes are raised ever higher. In fact, Sharky may be playing for his very soul. That sounds so dour. But it isn't. 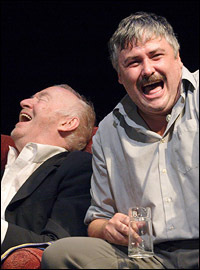 After seeing McPherson's intense "Shining City" last month at the Studio Theatre in Washington, I wouldn't have imagined laughing myself silly to another of his plays a few weeks later. When curmudgeonly, older brother Richard comes home drunk from getting some "bits" for Christmas dinner, he stumbles into the house singing his own Christmas medley (including "O come let us redore him" and "Oh the weather outside is frightening"); it's silly, but you can't help but laugh at the joy he takes in singing in the face of his miserable condition. Or at the way Ivan nimbly picks his way around the house in a drink-induced and half-blinded stupor (he's lost his glasses). Like "Shining City," "The Seafarer" deals with serious themes -- guilt, loneliness, faith -- and you're constantly bracing yourself for a tragic turn. But the play is ultimately, and unexpectedly, uplifting. Ciarán Hinds plays the dapper, mysterious stranger, Mr. Lockhart, who shows up Christmas Eve for a card game, and eventually reveals himself to be the devil himself. Although this sounds hokey, it doesn't play hokey. The devil hasn't appeared so tragic, or so human, since Milton's Paradise Lost. As Chris Jones of the Chicago Tribune said, "to understand hell, we're told, you just have to recall when 'you see all the people who seem to live in another world all snuggled up together in the warmth of a tavern or a cozy little house, and you just walk and walk and walk and you're on your own and nobody knows who you are.'" in a season when many of the best new movies, like “No Country for Old Men” and “Before the Devil Knows You’re Dead,” are bare of any sense of salvation, Mr. McPherson’s allowance of a provisional, redeeming grace has its warming charm. You don’t have to believe in it to be moved by it. Besides, transporting acting like this has an amazing grace all its own. Nine or so years ago I complimented a colleague on her suit, which paired a jacket with a skirt in an unorthodox but attractive combination. She said she got it at a store on the Upper West Side of New York where the owner knows how to put outfits together. Nine or so years and a decent condo down payment later, I don't know what I'd have been wearing all this time had I not learned about Darryl's. 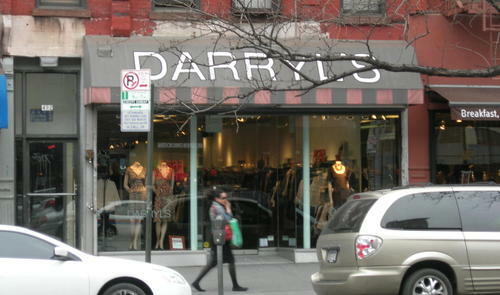 Located between 83rd and 84th Streets on Amsterdam, Darryl's is a small shop packed with simple, beautiful clothing for women. The merchandise ranges from casual sweaters and slacks, to stylish suits, to cocktail dresses. It's not inexpensive (my mother says when I walk in the door Darryl hears "cha-ching! "), but it's not one of those stores where they sell only size 0 pants for $300 and up (how can 19 year olds who wear size 0 afford $300 pants -- by saving money on food?). When I first started going to Darryl's he carried French and Italian designers I couldn't find elsewhere. Sadly, given the poor value of the dollar against the Euro, those days are over. Darryl's now carries such makes as Cyrus, Teenflo, & Trousers, and BCBG. Though the selection doesn't seem as unusual as it once was, it's still worth piggybacking off Darryl's good taste. Not to mention his judgment as to what will work for you -- by the time I've gone through the whole store and picked out what I want to try on, he'll have filled the fitting room with additional items he's picked out ("your assignment," as he puts it). If you need a nosh before shopping, there's a Le Pain Quotidien next door. If you want to forget how much you spent after shopping, have a chocolate malt at Homer's across the street or a drink at any number of local bars. Or if you need to buy some goodwill from children in tow during your shopping spree, check out West Side Kids in the next block north. If you're shopping for a gift, they'll ship for you; good news when mysterywriter bought a gigantic dog for our niece in Charlotte. (I managed to convince my Charlotte sister (the mother of the aforementioned niece) and her family to make the trek to Darryl's from the Natural History Museum a few months ago based on the promise of a nearby toy store and malt shop. There's something for everyone in this neighborhood.) Check out the west side block by block here. I can think of no better way to start a weekend morning in New York than with brunch at Danal. The first time I went, many years ago, I had the tart, which, that morning, was made with roasted tomato and goat cheese. It was possibly the best tart I've had there, or was it just that I was so taken with the place that it still sticks in my mind? We were seated in the back of this slightly below-ground level French-country style restaurant in the east village, next to a woman loudly proclaiming to her dining companion that no great thinkers believe in God. The menu changes, but includes some standards, with variations. As I mentioned, there's always a tart, with seasonal toppings. There's usually an Eggs Benedict-like dish with chicken apple sausage -- even if I'm not in the mood for eggs this dish is tempting, the sausage is that good. You can expect to find an omelet, a frittata, pancakes -- sometimes, decadently, with chocolate chips -- a couple of salads and sandwiches, and more substantial entrees. And wonderful, creamy cafe au lait, served in large bowls, not to mention the unsweetened bowl of hot chocolate MysteryWriter is fond of and I always envy. Coffee is served via French press. The atmosphere is haphazard and cozy. Potatoes and other produce are stored in baskets and servers retrieve the mismatched plates from rustic china cabinets. When we first starting brunching there we often encountered a wait, at least once in cold rain on the sidewalk. In recent years -- after they opened a second floor -- we haven't had a problem getting a table on Saturday or Sunday morning. After brunching at Danal's, you can satisfy your sweet tooth across the street at the newish location of Sundaes & Cones, an Asian-themed ice cream place (think lychee and ginger, as well as more common flavors) with benches out front that make you think you could be in Fairmont, West Virginia rather than the east village. Before or after, be sure to stop in the Jillery (see the purplish sign behind Danal's in the above photo) to shop for jewelry, retro handbags, housewares (including Judaica), and assorted tchotchkes. The pill box in my purse is from the Jillery, as are the decorative magnetic clips that I use for appending mail and other important outgoing stuff to my (metal) door. Pudding Man has been known to sport cufflinks from the Jillery -- though we're both Washingtonians, we independently found not only Danal's but the Jillery. That's as random as running into David Duchovny on our way to Balthazar.